Peachy Keen | Small, but valuable. It’s summer, and in our house, that has come to mean peach season. I wasn’t ever much of a peach fan growing up, but it turns out that summer would be incomplete to my husband without dozens and dozens of peaches. Last week, we ended up at our favorite homemade peach ice cream spot in the mountains. My mom was in town for a few days, and we’ll take just about any excuse to get delicious ice cream. We also ended up with almost half a bushel of fresh peaches in our kitchen (thanks, Mom!). So what are you supposed to do with all of that fresh fruit when there are only two people eating? Cook it into things. We had a successful dinner the other night of “Savory Peach Chicken” from the Food Network (recipe here). Is it wrong that my favorite part of the whole thing was the toasted almonds? Scott liked lots of things about it, so the recipe is worth a try for sure. But the real winner was last night’s Peach and Raspberry Crisp from Ina Garten (recipe here). Ina isn’t Scott’s favorite TV chef, but I do kind of like her. You know what I especially like about her today? Her peach raspberry crisp. It’s amazing!! (I don’t like overuse of the exclamation point, so please take note of that double exclamation.) I semi-swore off dessert for a while, but I just couldn’t resist a small serving, which I consumed in under sixty seconds. Even the process of making the crisp was fun. It was my first time to drop peaches in boiling water to get the skins off easily, and it worked like a charm. I loved seeing how the skin color variations reached onto the surface of the peaches themselves. Beautiful. And biting into the peach crisp didn’t disappoint. The raspberries gave it a slightly different twist from the standard peach dessert, and the topping was the best mix of crisp and cakey. Om nom nom. 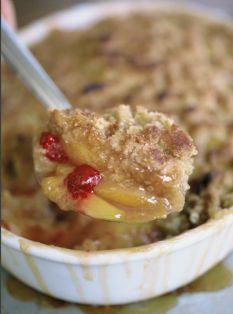 This is my favorite crisp/cobbler recipe I’ve made in the past few years. And that’s even despite how difficult it was to incorporate cold pieces of butter into the dry topping mix without a mixer… can’t wait to have our kitchen back! So that’s all that’s going on today. Daydreaming about last night’s crisp and trying to forget that it’s still in our fridge. We also played mini golf last night. I did great except for those two holes with 6 strokes each. Ha ha. Turns out that if I miss par, I get kind of loosey goosey with my golf. It’s good that Ina has finally done something redeemable. I bet she made that for the queen of England while vacationing in Monaco while swimming in gold coins. Says the man whose favorite chef has TV episodes in which she A) cooks for British royalty and B) vacations in Monaco. I say neither one of those would make food any worse. I don’t know about the gold coins though. They could weigh down a peach crisp topping.